ZipperAgent Calendar provides an integrated view of all the tasks, calls and meetings scheduled and managed through ZipperAgent Activities. ZipperAgent Calendar can also display meetings from your main Google Calendar or Microsoft Exchange Calendar if those are integrated with ZipperAgent. Please refer to “How to integrate” document to know more about how to integrate external calendars. NB: ZipperAgent Calendar provides you VIEW ONLY option for the external calendars. Actions like scheduling an event on the external Calendars are not allowed. To view the calendar in ZipperAgent, click on the Activities menu available in the top menu from any page in ZipperAgent and then click on the Calendar. ZipperAgent Calendar shows you the current Month view by default. You may change the view to “Week” or “Day” by clicking on the options available at the top right corner of the Calendar. You can also jump to today’s events or move between time periods by clicking the left and right arrow buttons. Click on the “Refresh” button to see latest activities. While the default Calendar view shows all types of activities, it can be filtered to show only the desired type (Task or Call or Meeting). Click on the “Type” dropdown field at the top left corner of the page, to filter the Calendar by Activity type. Clicking on any item on the Calendar will display a small window with the details of that activity. You can edit the activity right there and save. You can drag any activity from any calendar cell and drop it to another cell to change the activity date/time. ZipperAgent will automatically update the activity dates with the new cell date. Click and hold the event and drag it to any other cell. You can create a new activity by clicking on an empty cell or on any empty space on an already occupied cell. 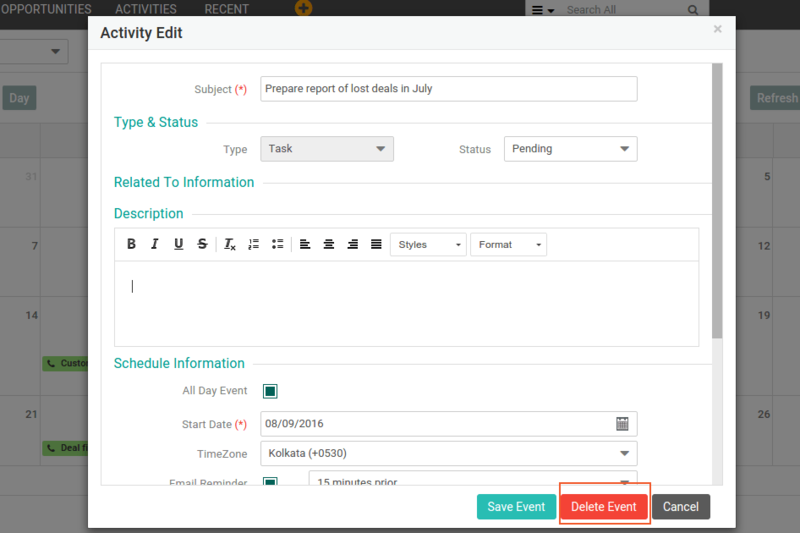 While on the activity details dialog, you can delete the activity by clicking on “Delete Event” button. If external calendars are integrated, it will be shown at the top of the calendar. 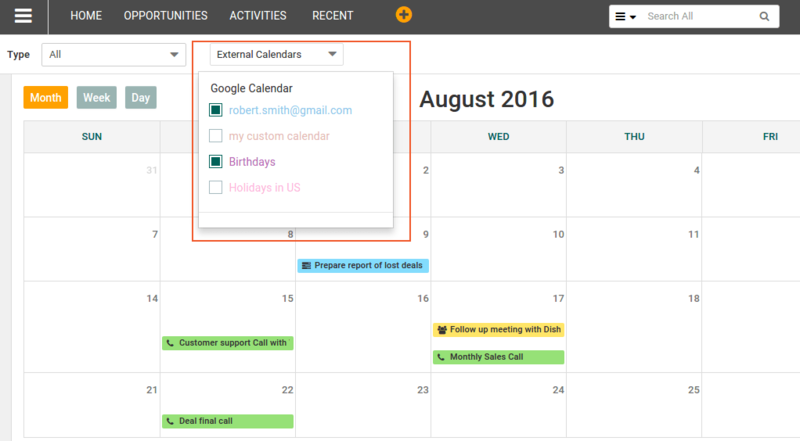 ZipperAgent can integrate your external calendar along with custom calendars (if any), holiday list, birthdays etc. You can choose to select the kind of external data you want to see on your Calendar by clicking on the corresponding checkboxes. For more details on how to create and manage an activity, you can refer to help document “Working with Activities”.